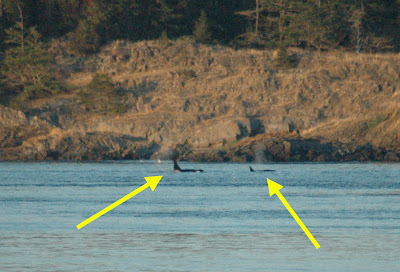 Orca Watcher: Who says you can't watch transients from shore? You can - the opportunity just doesn't come very often and they'll probably be reeeaaaalllly far away. The above photo was taken last night from Cattle Pass, looking across towards Lopez Island. Despite there being three groups of residents in the area, the best opportunity for shore-based whale-watching was actually of this relatively large (~8 animals) group of transients that were making their way south down San Juan Channel. For those who aren't familiar, residents refers to our fish-eating Southern Resident Community of killer whales, which are called residents because they spend a lot of time in the area from May-September feeding on the salmon that are spawning to the Fraser River. Transients refers to another type of killer whales. They occur in much smaller groups, roam much farther with much less predictability, and feed primarily on marine mammals. 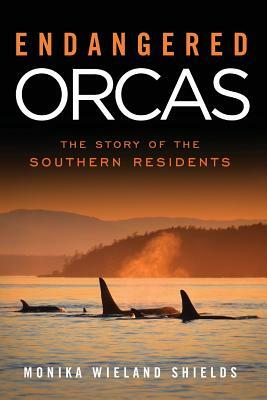 Residents and transients are all part of the same species, Orcinus orca, but despite inhabiting the same geographic area they do not interact, socialize, or breed with one another - and genetic evidence suggests this has been the case for the last 10,000 years, or since the glaciers receded from this area.